Pentium processor, 256 Mb RAM, 50 Mb free disc space, Internet Explorer 5.5. ...... Helium makes it easy to find your favorite music by searching for criteria such as Artist, Title, Genre, Rating etc. Avoid manual typing by downloading artist and title information from various sources on the Internet (freedb/CDDB, Amazon.com, Discogs to mention a few). Helium Music Manager supports downloading of album pictures, artist pictures, track information, artist relations, biographies, discographies and lyrics. 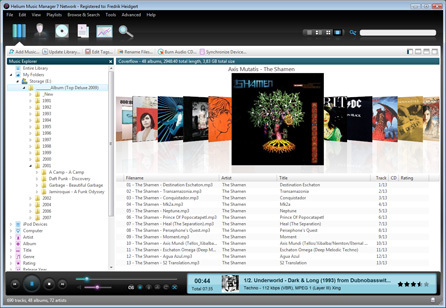 * Supports mp3, mp4, flac, ogg, wma and more as well as audio CDs, vinyl and tapes. For user with large collections we offer support for Microsoft SQL Server and MySQL for improved performance. * Add or correct missing or incorrect meta-data using the many tools available for tagging your files. Remove, switch, add or copy tag contents between files and fields using batch operations. Qweas is providing links to Helium Music Manager 9.0 as a courtesy, and makes no representations regarding Helium Music Manager or any other applications or any information related thereto. Any questions, complaints or claims regarding this application Helium Music Manager 9.0 must be directed to the appropriate software vendor. You may click the publisher link of Helium Music Manager on the top of this page to get more details about the vendor.